Villedieu des Poeles, not sure if the photo is attached. Lovely place, they set off a firework display to welcome us as we drove in, and churchbells to send us off on our way the next morning. and about 15000 people were there; we were about 5 rows back from the stage and had a super view of everything. Well done Inverness for putting this on for another year, and what a fantastic fireworks display at the end!! 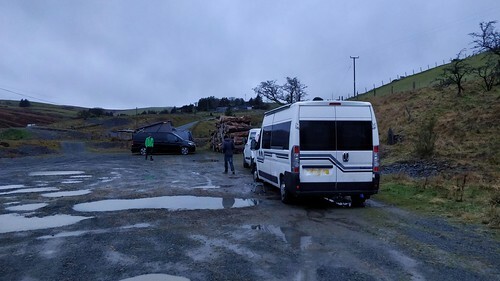 Up fairly early the next morning and away down the A9 to Ralia Cafe near Newtonmore for breakfast; too early to overnight here this time, and we on a mission to visit family in Dundee and then Bathgate, so we had our first 2019 overnight at Perth car park instead to score 1/1 for this year. Pretty cold here that night and we lost our water when the van went below 5 deg inside during the night (-5 outside) to trip the frost protection on the water boiler; good job it was only a short run on to Bathgate where we stayed for another couple of nights without incident. This was originally posted on the 2018 thread but moved here for consistency. Pleased this has carried on having missed most of last year due to the van build taking longer and a few other issues preventing me getting away as much as I wanted, but the aim is defo to do the challenge this year. 1/1 Spent last night at Newbiggin Common, quite simply the windiest wildest night I've ever spent anywhere, including my days in the Military, but thoroughly enjoyable. Roll on February. We're joining in this year! Here is our 1/1 last night near Caernarfon. First one was last Saturday at the Sir Walter Tyrrell pub in the New Forest. Last year, despite having a full time job, I managed 104 nights in the bongo, of which 15 were wild camping! None of the nights were work-related. Is that impressive or what? So far this month I have been out 15 nights 3 at a rally 12 wilding about average for the time of year for me.